Goodreads Summary: Kate Winters has won immortality. But if she wants a life with Henry in the Underworld, she'll have to fight for it. Becoming immortal wasn't supposed to be the easy part. Though Kate is about to be crowned Queen of the Underworld, she's as isolated as ever. And despite her growing love for Henry, ruler of the Underworld, he's becoming ever more distant and secretive. Then, in the midst of Kate's coronation, Henry is abducted by the only being powerful enough to kill him: the King of the Titans. As the other gods prepare for a war that could end them all, it is up to Kate to save Henry from the depths of Tartarus. But in order to navigate the endless caverns of the Underworld, Kate must enlist the help of the one person who is the greatest threat to her future. Henry's first wife, Persephone. I love mythology and really enjoyed the modern twist Aimee Carter put on her debut novel, The Goddess Test. I have been looking forward to Goddess Interrupted to see where Carter would take the story and what twists she would put on this second book in the series. While I have some issues with this second book, it is still really entertaining and a treat for mythology lovers. At the end of The Goddess Test, Kate leaves her new husband, Henry, to spend her six months above on a vacation as per their agreement. While Kate is disappointed that Henry never visited her while she was above, she is very excited to get back to him and start their life together. Unfortunately, scheming gods and goddesses have other plans for Kate and Henry. 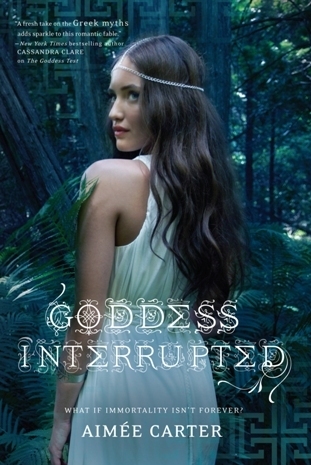 Goddess Interrupted is set almost entirely in the underworld and I loved the setting. Kate moves into the dark but beautiful palace but soon after, she goes on a quest with James and Ava that takes them through the underworld, which is great because Aimee Carter’s setting is both dreamy and hellish. Goddess Interrupted is very similar to other middle books in a YA series in that the couple who fought so hard to be together in the first book now face numerous relationship problems in the second book, problems that could be quickly resolved if they just sat down and had a mature conversation with each other. I know, I know. If they did that, then most of the conflict and tension would be gone from the plot. Instead of being the warm, loving husband Kate yearns for, Henry is cold and distant. I hate that Kate spends a good portion of the novel wondering if Henry will return her affections and being jealous of his ex-wife (and her half sister), Persephone. I was frustrated by Kate and Henry’s lack of communication and felt that all the progress that they made in the first book went out the window as soon as the second one began. It was like they were starting their relationship all over again. Additionally, Kate is made to sit out most of the fighting and so the reader is left out of a lot of the action as well. While I’m being critical of this book, there is plenty to love. The family dysfunction that Greek myths are known for is very present in Goddess Interrupted and the addition of Cronus as another antagonist in the story was great. Additionally, the book is very fast paced and I had a hard time putting it down. Despite its issues, Goddess Interrupted is totally worth reading but I have to warn you that it ends with a heck of a cliffhanger. I am dying to read the next book in the series to see what happens. Content: Kissing, sexual situations, profanity and violence. It's still on my TBR, but I probably won't rush quite so quickly to read these two - maybe it'll give Aimee Carter a little more time to get the next one out.